The shortage of headteachers is well documented and effectively supporting them an ongoing concern. We talk to author and director of Integrity Coaching Viv Grant about the ‘sacrifice syndrome’ of heads and overcoming it to be a visionary school leader. As someone who has been in challenging leadership roles herself, Viv Grant fully understands what it takes for school leaders to overcome the struggles of leadership and to succeed in fulfilling their vision for a school. A former headteacher, Viv now works with current school leaders as an executive coach and director of Integrity Coaching. Viv has been in the education profession for over twenty seven years. Seventeen years ago she became one of the youngest headteachers to turn around a failing school. Around the same time, she became a mum and the demands of both roles began to take their toll. Last year, Viv famously wrote an article for The Guardian on her experiences as a headteacher, entitled ‘Isolation, stress and tears … the truth about being a headteacher’. ‘If we’re going to keep our school leaders in post against the backdrop of the recruitment and retention crisis, we have to be serious about the type of support we provide for them,’ says Viv. We bought Viv together with a group of school leaders to discuss the support that headteachers need and where they can find this. Viv opened the discussion by asking the group what the key experiences are that have shaped the way they lead. Blocking out time in the diary once a week for reflection and review was discussed. Building on the ability to recognise your own strengths and weaknesses, and developing a commitment to doing so, makes reflection a habit. One similar strand of thinking from the group was the impact that previous leaders have on their own leadership. Working with different leadership styles exposes a range of behaviours and emotions. One of the group revealed that they’d never had strong leadership aspirations but had been led so badly by numerous leaders that it made them determined to be a better leader. Finding out what type of leader you don’t want to be is just as important as finding out about the type you do want to be. Viv spoke about one pivotal moment as a headteacher. ‘One night I went on a home visit to a child who lived with his sister, who was also his legal guardian. She made it clear she didn’t want me there by raising her voice and swearing at me. I left, got back in my car with my colleague and broke down in tears for the first time. ‘That was a wake-up call for me. Up until that point I’d been wearing my ‘super head’ armour. I could deal with anything and not let it get to me emotionally. I’d been used to it for so long but that night I realised that showing my emotions wasn’t something to be ashamed of. 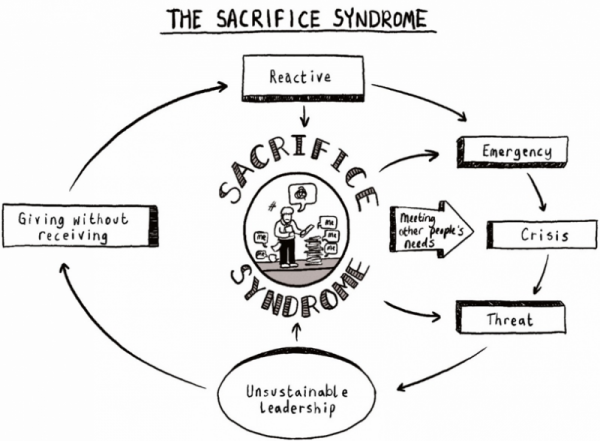 The sacrifice syndrome was coined by Richard Boyatzis and Annie McKee, writers of Resonant leadership: renewing yourself and connecting with others through mindfulness, hope, and compassion. Boyatzis and McKee refer to leadership in the business world but it’s extremely relatable for headteachers. They discuss how, as a leader, you’re expected to respond to and meet other people’s needs. You’re reactive to them all the time which isn’t sustainable but you get caught in the sacrifice syndrome without a way out. Viv presented the group with the following statement and asked what it meant to them. ‘A school leader’s vocational vitality, or capacity to be vital, present and deeply connected...is not a fixed, inedible condition, but a state that ebbs and flows with the context and challenges of the leadership life’ [Intrator & Kunzman, 2006]. The first reply was ‘leadership is fluid, not liner and you won’t always get it right.’ As a school leader you never know what is going to happen next or what challenge you will be faced with. 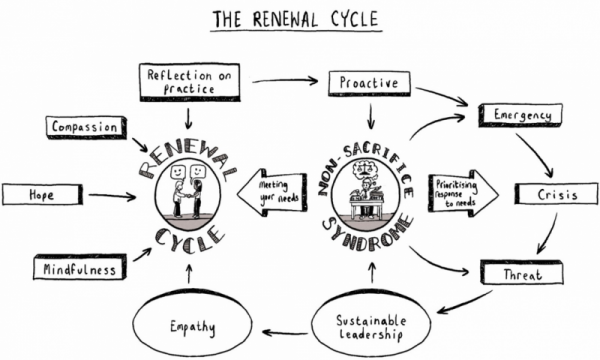 Boyatzis and McKee discuss the transition from the sacrifice syndrome to the renewal cycle. Leadership can be stressful and all-encompassing. Leaders need to be able to manage themselves by recognising and addressing the stress and creating ways of renewing themselves. School leadership is highly emotional and impacts on mental, physical and spiritual wellbeing. These are not exclusive, they are mutually dependent on each other. If emotional resilience isn’t maintained it will inevitably begin to have an impact on physical wellbeing. Visionary school leaders have the ability to set clear objectives and share them with their team so that they understand both the next steps and the end goal. Visionary leadership involves an element of calculated risk taking to take the right route, even when it may not be the easiest. To do this effectively, a leader needs to fully understand the strengths and weaknesses in themselves and in their team and have support available to them. Schools are complex organisations. Leaders work with staff on an emotional level every day and it must be remembered that they need support too. Our 23 top tips for new headteachers will help you prepare for your new challenges and responsibilities.